There are two tanks in the world today which are based on the Soviet T-72 but are not actual copies of that tank: the North Korean Po’kpoong-Ho (Storm Tiger) which uses T-72 configuration but T-62 parts, and the Chinese ZBT-96 series tanks which use T-72 components with a new hull and turret. Chinese armor design history actually begins in 1956 when the PRC bought a number of Soviet T-54A tanks and then the rights to build them under license. This tank, the WZ-120 or Type 59, began production in 1957. Essentially the production tanks were no different than the originals and as many as 10,000 were built in China (at Baotou by NORINCO). In the 1960s the Chinese modified the vehicle up to the same standards as the Soviet T-55, but with few external changes other than new headlight assemblies. This tank, the WZ-121 or Type 69, was built in several models to include the domestic Type 69-I and -III and the export Type 69-II with a copy of the British L7 gun (105mm). The tank continued to evolve through the Type 79 (WZ-120D) in 1984, Type 80 (ZTZ-80) in that same year with a new six-road-wheel suspension, the Type 88 (ZTZ-88) in 1989, the Type 85 with a new turret in the same year, the Type 85-II in 1989 and finally the Type 85-IIM with a 125mm gun and autoloader. (ZTZ is the new Chinese designator for main battle tanks, and stands for “zhu zhan tanke” or main battle tank. This pretty much expended the “stretch” in the basic T-54A design, and the next series of tanks were based on the T-72M tank. (A copy of the T-62, the WZ-122, was not accepted for service or placed in production). 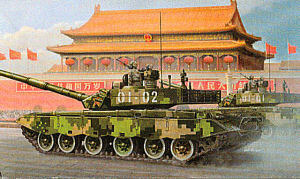 The next tank, the Type 90-II, appeared in 1991. It was a new design but borrowed heavily on the T-72M with its road wheel copied from that tank along with a 125mm gun and autoloader. A derivative of this design, the Al-Khalid, was sold to Pakistan along with production rights. The next full model was the WZ-123 or ZTZ-96, which was the transitional mechanical model between the T-54A and T-72M designs. An improved version, the ZTZ-98, was first publically shown in 1999 at the PRC 50th Anniversary Parade. This tank was longer and lower than the T-72M it was based on, and used several innovative features such as a laser blinder for use against ATGM teams. This tank evolved into the ZTZ-99. which appears to be the family which the Chinese will make their new standard tank system. There are at least three models of the tank in service (albeit in small numbers): the ZTZ-99A, which is based on the T-72M with a copy of the German MTU MB 870 V engine (1500 HP), a ZTB-98 125mm gun (equivalent to the 2A46M) with the ability to fire a Chinese made version of the 9M119 “Refleks” antitank guided missile, and other modifications. The ZTZ-99A1 is the same tank but now fitted with modified armor and a Chinese copy of “Kontakt-5" reactive armor protection. The latest variant, the ZTZ-99B, uses a Chinese copy of “Relikt” second generation reactive armor protection on the hull and built into the turret face, and more reactive armor on the sides of the turret. This tank was publically shown in August 2009 at the PRC’s 60th Anniversary Parade. Hobby Boss has now released kits of the ZTZ-96, ZTZ-96A, ZTZ-99 and ZTZ-99B. These are the first in a series of modern PLA equipment and join previously released kits of the ZLC-2000 and ZBD-04 infantry combat vehicles, and are due to be followed by at least nine more wheeled and tracked armored vehicles (Trumpeter and Bronco are also doing new build PLA vehicles as well). The ZTZ-99B kit is nicely done and very conventionally laid out as a model kit; anyone familiar with DML or Trumpeter kits will have no problems with this kit. The parts are well thought through on their breakdown and permit Hobby Boss to use the same parts for four different kits with only minor sprue swaps required. There are the usual quirks found in most model kits. The “blade” type shock absorbers (similar to the Russian ones, parts A15) do not connect to the road wheel arms so the connecting rods will have to be added from scratch. The road wheels have vinyl inserts to permit movement but the drivers and idlers are fixed. The kit comes with single link tracks that replicate the “asphalt” or “street” tracks as were used in the parade; these all have rubber pads on their outer faces. “In action” photos of ZTZ-99 series tanks show they also have a set of combat tracks with steel faced cleats that look very similar to US T80 series tracks from WWII and Korea. Each track link comes with the end connectors in place and a hollow guide tooth; I do not have sufficiently detailed photos to see if this is correct or not but it seems to match the photos I do have. The entire glacis reactive armor array is a single piece (H19) and installs at one shot. It appears to be designed to fit over the glacis fittings left over from the ZTZ-96 and ZTZ-98 designs with no modification required. The lights and other glacis details mount on it or through it once in place. Note that all six etched brass grilles have to be installed at this time as well. The fenders are separate which is good, but then the sponson bins and fuel tanks each consist of one piece which mounts on the fenders (at least this means there are no Tamiya-esque open sponsons below the fenders!) As these are not slide molded, the exhaust assemblies have to be installed separately (H15 and H16). The kit comes with all of the details needed for the 99B turret to include two single-piece reactive armor arrays at the rear; each of them has an interior liner which is correct, and for simplicity’s sake the bars of the rear turret basket sides are molded to the inner parts of the assemblies. The turret also has the laser blinder device which goes behind the gunner’s hatch on the left side of the turret and a combination wind sensor/laser illumination warning mast behind the commander’s hatch. Ten individual barrels for smoke grenade launchers form four assemblies (two fours and two singles) for the sides of the turret, and the lift rings for the frontal armor modules are provided as separate parts as well. The QJC-88 machine gun (a lightweight Chinese redesign of the famous “Dushka”) comes on a separate sprue and consists of 14 parts in its own right. There are some areas where the kit skimps a bit, but for the most part the work in its design is yeomanlike and will pass muster with most critics. There are only eight bits of etched brass and no clear styrene for fans of those materials. Modelers looking for fast projects will have to accept the fact that this kit has single-link tracks and they will have to be installed as there are no alternatives. One could try to fit a pair of Italeri M47 tracks to it if they could put up with the incorrect center guides, but they are going to be too short; ditto using two sets of AFV Club T80E1 tracks for the M26/M26A1/M46 tanks (the tracks are about 595-600mm or right at 17mm – a scale 23 inches). The kit comes with a large decal sheet and markings for at least three different tanks: I - tank 405, exercise “Northern Sword” 0607 (S); II - tank 202, “Peace Mission” 2009; and III - tank 01-02, PRC 60th Anniversary Commemorative Parade, August 2009. The first two are in the standard PLA three-color camouflage (sand, olive green and olive drab) but the Parade tank is in the “digitalized” camouflage which debuted during the parade. Color sheets are provided for all three and a 1/35 scale black and white sheet is provided with the digital pattern laid out on it for the brave soul who wants to attempt it! The “Peace Mission” 2009 tank is the most colorful as it comes with Chinese national flags and regimental insignia which go on the ERA packages on the sides of the turret rear as well as Chinese red stars on the front faces. Overall this model fills the bill and is a very nice kit of one of the latest main battle tanks in the world today.